“It seems that the India-U.S. bonhomie has reached a new high,” said the Daily News and Analysis (India) in an editorial. 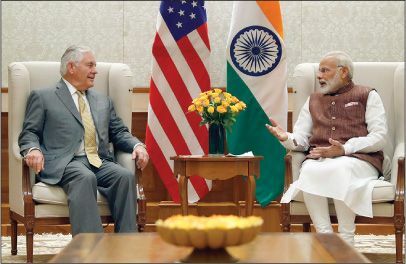 U.S. Secretary of State Rex Tillerson was full of praise for New Delhi last week as he toured India, Afghanistan, and Pakistan. He spoke of how our two nations’ partnership would endure for “the next 100 years” and effectively “promised to support India’s rise as a leading power.” The Trump administration is cultivating India as a “counterweight to China, whose growing clout in the subcontinent and in the South China Sea area has become a global concern.” And this is not just rhetoric: The U.S. offered to supply India with F-16 and F-18 fighter jets, as well as armed Predator drones.